I added and improved quite a bit in this new version. 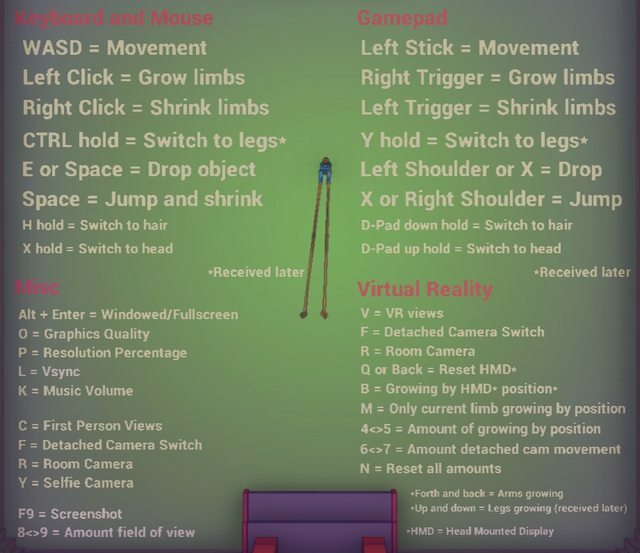 Previously I already made it work with Virtual Reality: http://ludumdare.com/compo/2015/12/22/forklift-man-in-virtual-reality/ which is now also improved. You might have wondered before why Forklift Man can grow his limbs at will yet his head is bald as if he can’t grow something as simple as hair. As you can see that is now finally fixed in the new version. Just hold H to grow your hair as long as you like. They appear to be rather useless new growing abilities but I made a simple puzzle around it in the last room. I also improved the physics for carrying boxes quite a bit. Before that I gave another physics grab option of UE4 a try but it only turned out worse with arms literally getting broken and knotted and boxes spinning around. But it is now significantly better anyway, you don’t have to be as gentle to the boxes anymore. I also made a few tweaks to the cameras and the rooms. It turned out a lot of people thought putting a box on a pillar solves the 2nd room. Because video game logic I guess. Well, no more of that, that pillar is now gone and it hopefully is more clear now that you need to build a bridge (or anything that gets you up on the other side). Just press ESC ingame to get to this controls screen. This entry was posted on Friday, January 1st, 2016 at 3:07 pm	and is filed under LD #34. You can follow any responses to this entry through the RSS 2.0 feed. You can skip to the end and leave a response. Pinging is currently not allowed. Why can’t I see the images? Don’t know, sometimes they are there and sometimes they are not. I added now alt text links that should always work.